Scrappin' Becky B.: I've Got Spring Fever!!! Mornin' folks! Well, I have a MAJOR case of spring fever so I haven't spent much time indoors to craft. As I get home from work each afternoon my back yard is calling my name, so I change clothes and head outdoors! I've been pruning back old foliage, dividing and re-planting hostas, planting several flats of flowers, as well as tomatoes, cucumbers, peppers and watermelon over the course of the past several days. My apple tree and blackberry vines are blooming, so I'm anxious for berries and apples to start appearing. Once my grass has greened up a bit more, (parts of it are still dormant), and my roses start blooming, I'll snap some pics to share with you. 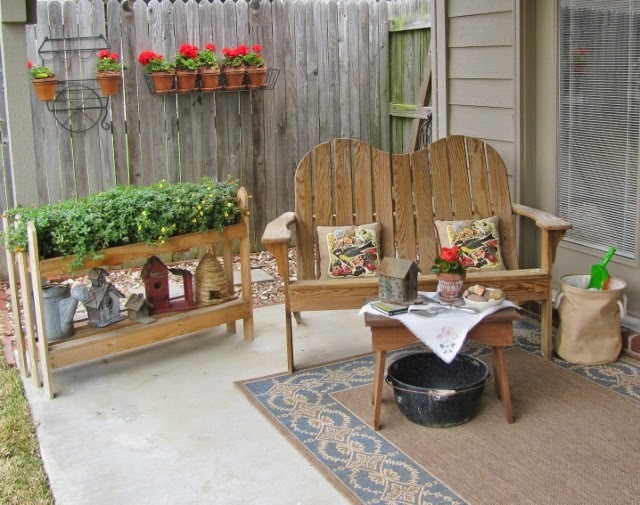 The first pic is of the double Adirondack chair and cedar picket planter that my father-in-law built for me. 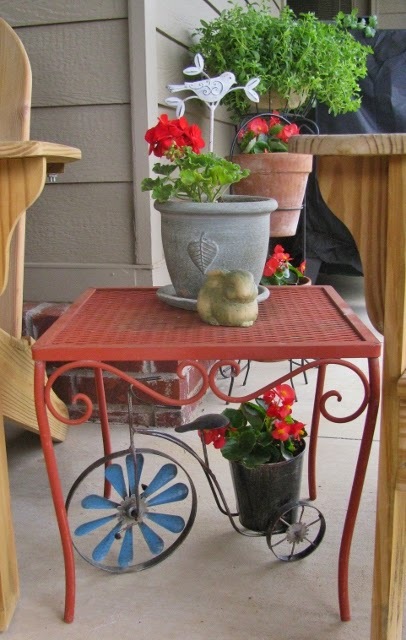 On the fence behind those are pots of pretty red geraniums, which are some of my favorite flowers! That spot gets lots of sun, and the geraniums love that! The little table in front of the Adirondack chair was a leftover from a wood shop class from the intermediate high school where I used to work. 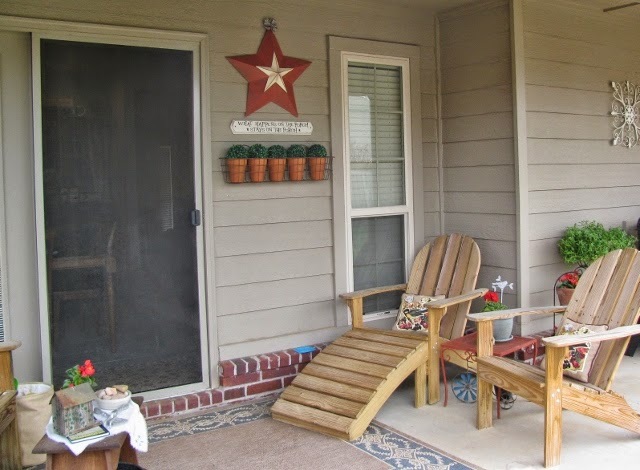 The instructor was going to toss it out at the end of the school year, so I rescued it and brought it home to use on my back porch. The blue enamel bowl under the stool was a find that I discovered at an antique mall for $5.00. I loved that it had a bail handle, so I scooped it up and now it serves to keep canned pop cold when filled with ice. I added some fun throw pillows to the furniture this year. 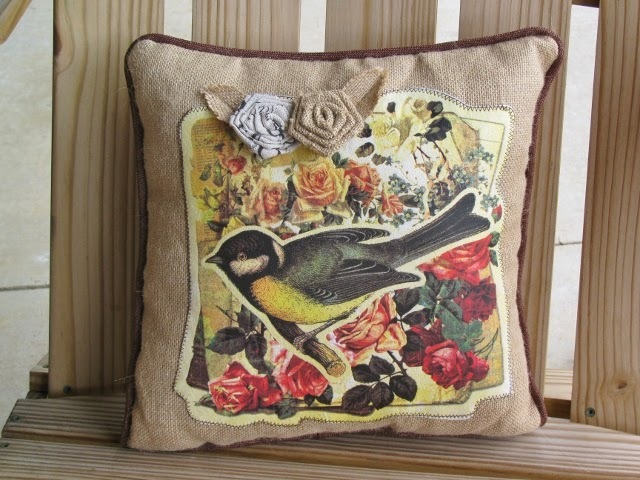 I spotted these cute burlap pillows with the vintage bird applique and fabric rosettes on clearance at Stein-Mart for only $3.99 each! I bought 4 of them and they look adorable on my back porch! Thanks for dropping by today! I hope you have a great week and are able to get outside and enjoy the sunshine!